The authentic leadership approach is a concept introduced by management expert Bill George in his 2003 book “Authentic Leadership” and developed further in the later book “True North.” George describes authentic leadership as a leadership style that is consistent with a leaders’ personality and core values, and that is honest, ethical and practical (Northouse, 2013). 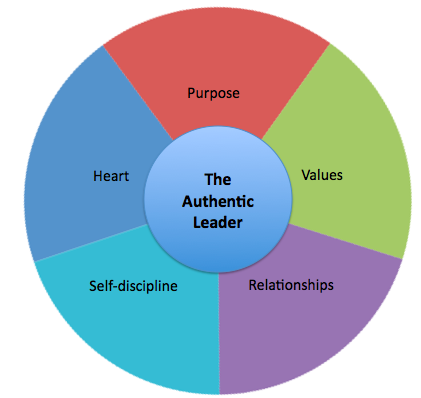 There are many leader styles in every type of job but when you work for a leader who is authentic then you notice it. You really notice it when you work for one and they get transferred and their replacement is the polar opposite. My senior year in high school I worked for a restaurant. This was my first job and I wasn’t sure what to expect. My manager’s name was Jody. He was awesome because he really seemed to care and want the people he was managing to grow. An authentic leader is more interested in empowering employees than in money or personal power, and is guided by compassion and heart in everything they do. Authentic leaders are dedicated to continued personal growth and committed to building lasting relationships and strong organizations (Northouse, 2013). I found it great to work for Jody because he really cared about all his employees. What he did for the people he worked with left a long lasting effect. It’s been over 15 years and I still remember him and would love to work with the guy today. I remember asking Jody while he was such a good manager and he said he learned it from his father. He said his father always told him to build strong relationships with everyone he encounters no matter the status in life. He treated everyone the same at work from the assistant managers to the dishwasher. Authentic leaders have the capacity to open themselves up and establish a connection with others (PSU Lesson 12, 2013). Jody always looked for ways to communicate with people even if the subject they were talking about was foreign to him. I recall he would often read up on a subject just to be able to talk to an employee. Jody was open to everybody and you could always talk to him. The thing I remember about that job was when Jody got transferred. They replaced him with a robot. This guy cared little about his employees and only focused on numbers. I really appreciated him that much more when he left and often compare other supervisors I have worked with to him. If I ever get the opportunity to become a leader in my current job I hope to model myself after people like Jody. George offers great advice when trying to become an authentic leader. George suggests that to begin developing your authentic leadership style, you should begin by assessing yourself against the five qualities of an authentic leader. These qualities are understand your purpose, have strong values about doing things right, establish trusting relationships, demonstrate self-discipline, and be passionate about their mission (Northouse, 2013).